You know what would be productive? Go to the Canadian International Auto Show on Family Day weekend and try to take pictures and spend time with specific trucks. That said, when that is the only time you have available you go. They are relatively new technology but I have never seen so many 360 degree cameras in one place. People are walking around with poles which I can only assume were taking video of the massive crowds and the occasional car being swarmed. If pictures are what you want to do, which it seems almost everyone has decided, then the museum displays of some admittely amazing cars is the place to go. These cars must only live in the back of a transport truck because I have never seen any of these on the road. The main reason I went to the show was to look at different Pick Up trucks for the camper. The research that I have done so far has been overwhelming. For every different model of truck there seems to be ten different but major options that make a huge difference. There are different engines, box sizes, seating arrangements and drive train options and each choice comes with a different set of abilities in gas milage and payload each of which are vitally important. A few weeks ago I went around to a couple of dealerships and talked with any sales people who would spare the time. While both GMC and Dodge dealerships were willing to sit down and chat. 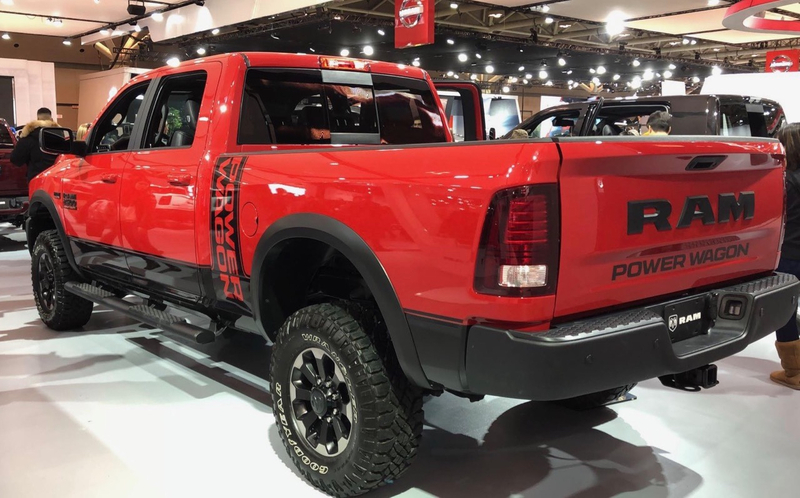 In those conversations at a time when money wasn’t a part of the conversation I came away thinking that the Dodge Ram Powerwagon was the truck to look at. It has the payload for the truck campers I am looking at and 4×4 capabilities that must make it impossible to get stuck ever. The show gave me the chance to finally see the truck up close and it is astounding. First off, for a person of average size this truck is massive. I tried to look into the box of the pick up and bumped my chin on the top edge! The top of the front hood is at eye level and the wheel wells are above my hips. In the winter many people around me like to put the windscreen wipers up so they don’t freeze to the window. I tried this and found out I just couldn’t reach. The hood was down but I can’t imagine how I would replace the windsheild fluid or close the hood without a step stool. That said, changing the oil must be super easy as there is no reason to use ramps or jack it up to get underneath. Seeing the truck made me realize that this purchase will mean I need to change my philosophy for my transportation. I currently own the largest car in my life, a Toyota Matrix. All of my cars have been small and nimble. They have been purchased mostly on a concept of minimal cost and ability to mostly satisfy the day to day needs of getting around town. A truck on the other hand will be purchased primarily for the trip. The cost of it though will mean it will have to be owned for longer than that. Still… the Powerwagon is an amazing truck. As standard it comes with things such as a winch and high clearance that I would at least consider adding / modifying to anything that I may get. It still remains high on the list of possiblities and now I am looking into 4×4 clubs to learn how to use all of its capablities. 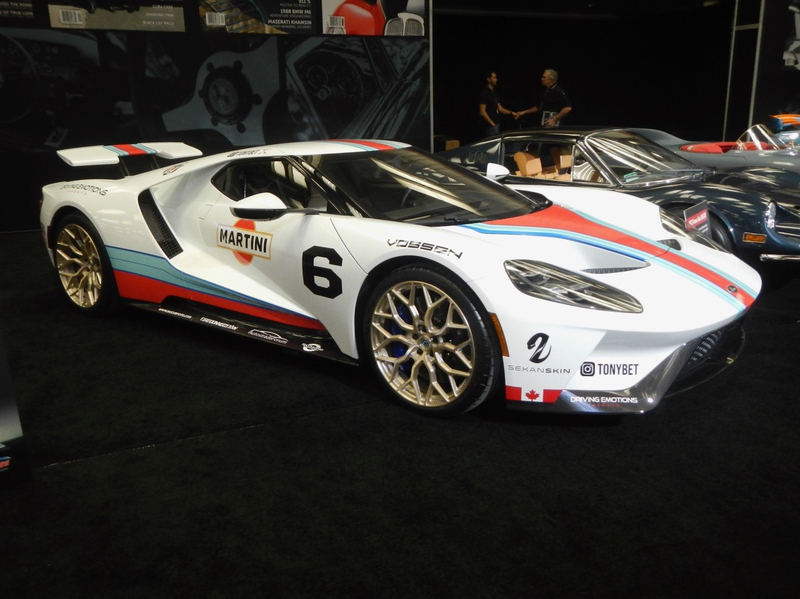 As for the Auto Show, next year I will just have to find some time to get there on a quieter day. There were so many amazing vehicles that I wanted to get a chance to spend more time with but I just don’t have the patience to wait for a quiet time which for some trucks never seemed to happen. Somehow I will have to find a way to make that happen. I recently “discovered” Instagram. Oh I had heard about it before, some of my friends had told me how cool it was but I chalked it up to yet another in the endless cycle of social media apps that I just didn’t have the time to keep up with. All of the apps, Facebook, Twitter, Instagram and the rest require time and effort, and I have a hard enough time organizing my day sometimes to keep up. But I decided to give Instagram a chance and in order to participate I decided to look back at some of my trips. So I am going through my trips and uploading a favourite picture each Wednesday. I decided to start with the trip I talk about most, my trip in August 2010 to India, Nepal and Tibet. I had wanted to go to Tibet ever since I was very young. I can’t remember exactly where I got the idea but I do know that one very major appeal was that it was remote, exotic, and unique. So after years of thinking about it, in 2010 I finally decided to go. After a little research into that area of the world I found that the easiest way to get a visa was to join a tour who would do the paperwork for you. Due to the sensitive nature of the area the Chinese government is hesitant to issue personal visas, so group visas are the way to go. The British company Explore was selected and a trip to India, Nepal and Tibet was on. Group trips are usually not how I choose to travel as I worry that they would be too restrictive but other than the logistical issues I am very happy that we went with Explore at this time. The mix of people my sister (she wouldn’t let me go alone) and I met on this trip were amazing. As a group we were looking to do more than just look around, we were there to experience these areas of the world. In particular we wanted to interact with our environment and the people we met. It wasn’t a consious choice, it was just the unique mix of individuals on the tour. 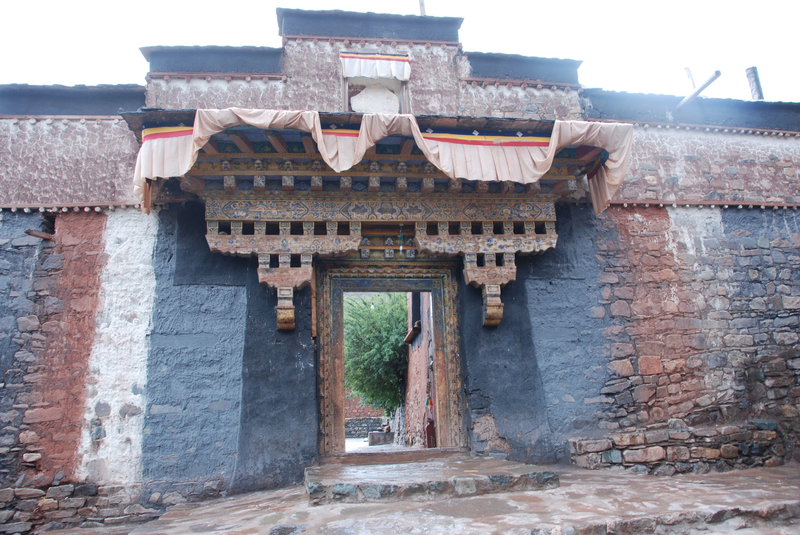 The advertised scheduled tour was a mix of hiking and driving over 21 days between Lhasa, Tibet and Kathmandu, Nepal. When hiking over mountain passes sometimes you have to make your own trail. Amazingly this pic does not show how steep this actually is! The trip was amazing but nothing can beat that day in Tibet. It started like many had already. We had camped in a rocky field on the edge of little village between two mountain passes, one of which we had hiked over the day before and the other we would hike over that day. We were in good spirits, the afternoon before we had taught a village worth of children how to throw a frisbee using a paint can lid. That morning we were hoping to say goodbye to the kids but unfortunately they were no where to be seen. The plan for the day was to hike over the second mountain pass and down into a monestary where we would be sleeping that night. I love mountains and believe that hiking in them is the best way to understand what they are all about. Hiking in Tibet is a mixture of loose rocks, amazing sights and dealing with exhaustion caused by elevations over 3800 meters above sea level. By about 10 am we were all packed up and headed out of town and began the steady climb to the top of the pass. Any progress where you have to gain elevation in Tibet is slow and even though the top of the pass wasn’t really that far away we took well over 2 hours to get there. The group consensus was that the top of the pass was the best place for lunch but as we were hiking darker clouds had gathered. The rain started slowly at first cutting our lunch short. As we headed down the dusty slope it got worse and the normally dusty tracks began to become muddy rivers. The further down we went the more the runnoff concentrated causing the last section of the decent to the monestary to become a hectic race against time to get to relative safety against being washed away. We made it to the monestary in what seemed to be just in time. Our guides took us through a mysterious door and straight to a room where benches ringed the edges. This was to be our room for the night so we took our chance to stake our claim to a portion of a bench and dry ourselves out. We were mostly dry when our guides came into the room to let us know that if we wanted to see chanting monks on this trip this would be our only chance, so wet or not we all headed up the hill. As we were about to enter the temple a couple of us donated so that we could take pictures, a difficult task as no flash is alowed and it is very dark. Without a tripod good pictures are next to impossible. Walking around the edge of the room in a clockwise direction (the manditory route) the seriousness of the monks was apparent. Chanting never stopped, as if even breathing was not allowed. Every monk was at a different place in the prayer so even if I could have spoken the language I am sure I wouldn’t have been able to tell you what they were saying. It was exciting and strangely calm all at the same time. The monks ranged in age from very old to quite young. As we walked around the temple many of them started to make eye contact with us. It seemed to be something that would have been forbidden as their glances away from the prayer cards were quick and they never stopped chanting. As we stayed longer the glances were accompanied with smiles. Monks outside the door to our room. After our circuit around the temple we headed back down the hill to our room. We thought that was going to be it for the day but a few hours later the roles were reversed. On their dinner break the monks skipped eating to come down and visit us. Being surrounded by over a hundred monks, none of whom speak english was a little odd. We were at a little bit of a loss but luckily Chris was there. Chris had a way of making things happen and it was his idea to create challenges. He gathered a few rocks, made a pile and then proceeded to throw pebbles at it to see if he could knock them over. 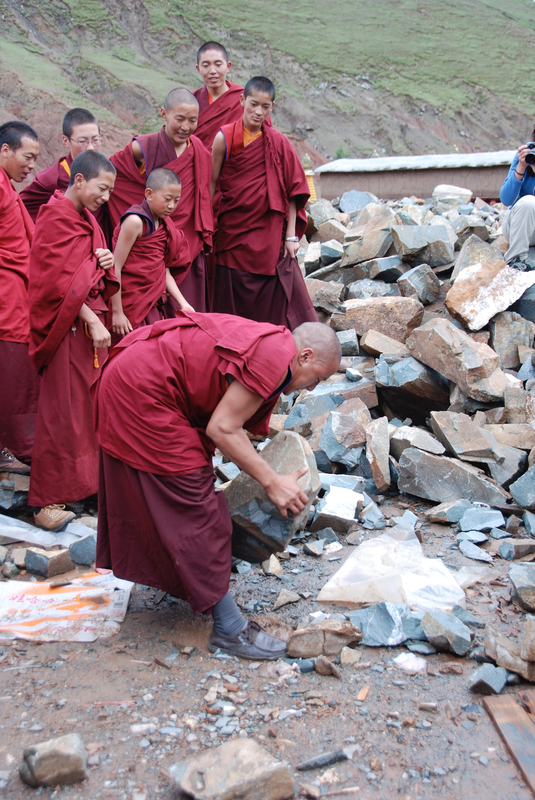 After a few throws we started handing out pebbles to any monk who was near to see who had the best aim. I can’t remember for sure but I think it was one of the monks who was able to knock it over first. What proceeded was a series of strength challenges from arm wrestling to an odd finger wrestling match and a game of what is the largest boulder you can lift. What do monks do to keep strong? Lift the closest boulder… they are everywhere! While some of us were proving how strong we were out came the phrasebooks. We started to try and practice our Tibetian which was semi successful and it was at that time that the one young monk with some english was shoved towards us. As it turns out the sum total of his knowledge consisted of WWE wrestlers names. After about an hour of this and without warning one of the older monks determined that the fun was over. I didn’t hear him speak but every monk just took their chance to smile and wave and they were off within a moments notice and that was it. They were back on the clock for chanting after their dinner break. It is now about seven and a half year on from that and I can still remember it like it was yesterday. Looking through the pictures in order to pick the best ones is very hard as amazingly I don’t have a ton of high quality ones. Being in the middle of a mass of red robed monks makes it hard to step back and photograph the event but I am glad that I didn’t. I think that if I had a lot of really good pictures I would probably have not been a part of the event…. and that is what I really love about that day in Tibet. Some of the monks even came into our room and checked out our stuff…. they were hilarious! In resent months I have come to the idea that a truck camper is probably my best option for the overland vehicle I am looking for. For a while I had considered getting a van and converting it but as this vehicle will become my primary transport as well a van won’t really work. Being able to separate camper from truck will make it more fesable. The bonus of a truck camper is that all the comforts anyone would want for extended travel. Truck campers have a bed that doesn’t need to be made each day, a kitchen and table and most have a bathroom with shower. Another advantage is that they have heating and cooling systems and can be insulated to combat colder temperatures. So in general I am looking for a few things. I am hoping that the entire vehicle will be as light / small as possible. While I don’t plan on doing major rock crawling with the camper attached being able to go off road. Being light will also help with some of the other compromises this rig will have to deal with. First compromise is that of payload. I am amazed at the small weights that pick ups can carry. That said for day to day driving the smaller the rig the better as fuel economy will already be much worse than I am used to. The second compromise is that of shipping. In order to get to some of the places in the world (South America included) it is necessary to ship your vehicle. Lower weight will hopefully provide some advantage to me. One shipping issue still to be overcome will be the height of the rigs below as I am fairly sure they wont fit within a shipping container, something I may have to figure out. So these are the current short list that research has told me would be good options for what I am thinking of. The Adventurer website states that this camper can fit on Nissan Titan and Toyota Tundra trucks and all of the pictures show it on a Ford F150. I am not so certain though as the weights quoted and the suggested amount you need to consider for your own belongings exceed the max payloads of those trucks. The nice thing about the Adventurer Campers is that they advertise 4 season insulation as a standard which is a definate plus. The Laredo SC is heavier than the 80RB and would need a bigger truck, which it looks like I will have to do anyways. One nice thing about this rig is how it makes use of a Cassette Toilet. If you are going to have a toilet then you will have to deal with the nasty mess that is left behind. In North America camp grounds have waste disposal areas where the RV’s dump their tanks through a hose you carry with the truck but outside of the USA and Canada these facilities are not common. As gross as it may seem to someone that has not used RV’s or trailers, having a cassette that you can take to an appropriate disposal area (any toilet really) is an important consideration if you have a bathroom on board. This camper has been designed and launched in the last year or two and was designed to fit the Ford 150. It is the lightest as well as the shortest camper I have listed and still retains having a bathroom. Anything smaller and lighter comes with that big compromise and isn’t currently a part of the thought process. A very big thing that I like about this camper is that the floor length is only 6.5 feet long which means that it will not hang over the end of the typical truck. The other campers either need to have an 8 foot truck bed or there will be overhang which doesn’t seem ideal to me even though the manufactures say that isn’t a problem. This rig is not a truck camper but I saw it recently and thought it was cool. It is the most expensive idea on this list and would require me to drive a motorhome to work every day but it is a self contained unit that would easily fit in a shipping container. The Mercedes Sprinter van chassis is also a very capable truck and should be able to get to where ever I would want to go with a camper. The other very cool thing about this RV is how flexable it is to a variety of different applications. So that is where I am at the moment. Do you or anyone you know have any experience with these or other RV’s / Truck Campers that may be useful? If so I would love to hear about it.